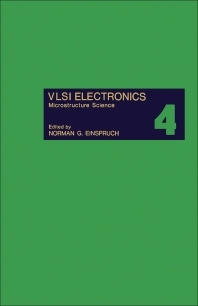 VLSI Electronics: Microstructure Science, Volume 4 reviews trends for the future of very large scale integration (VLSI) electronics and the scientific base that supports its development. This book discusses the silicon-on-insulator for VLSI and VHSIC, X-ray lithography, and transient response of electron transport in GaAs using the Monte Carlo method. The technology and manufacturing of high-density magnetic-bubble memories, metallic superlattices, challenge of education for VLSI, and impact of VLSI on medical signal processing are also elaborated. This text likewise covers the impact of VLSI technology on the design of intelligent measurement instruments and systems. This volume is valuable to scientists and engineers who wish to become familiar with VLSI electronics, device designers concerned with the fundamental character of and limitations to device performance, systems architects who will be charged with tying VLSI circuits together, and engineers conducting work on the utilization of VLSI circuits in specific areas of application.